A few years ago, I was sitting in the airport in La Paz, Bolivia. At nearly 4,000 meters above sea level the air is so thin you can get light headed. I sat there fighting sleep after a two day trip home from Bangladesh. Then an airline official came to tell me that the police wanted to see me. I was wide awake now, as I followed the neatly dressed official downstairs to a backroom on the first floor where the criminal police search luggage for drugs and contraband. While screening my bag they had found a strange object. A young policeman was sitting on a stool, holding a tool I’d picked up in Bangladesh. It was a crescent-shaped iron blade, with a metal shaft and a wooden handle, polished smooth with work and sweat. I’d bought it from a man selling used tools in a Bengali village. “What is this?” the cop asked. His face and demeanor were more of curiosity than malice. I relaxed. I wasn’t a suspect. He was simply filled with that human sense of wonder. And so I explained that the tool was a rice weeder. It’s called a “nirani,”or “khurpi.” It’s made to work the soil at ground level, while keeping your hand off the ground. 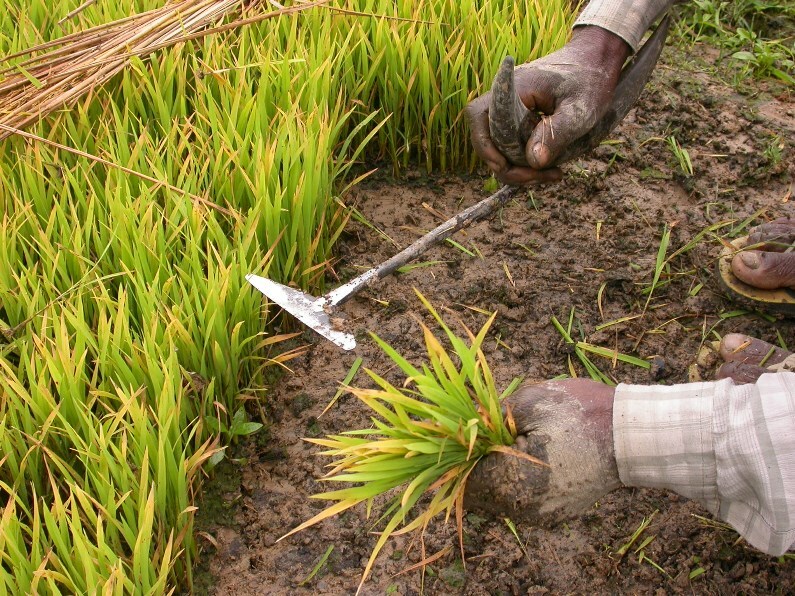 People use the nirani to weed the rice while kneeling in the field. 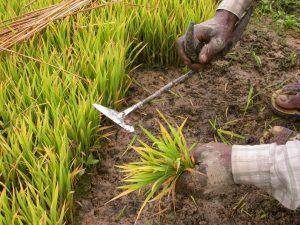 They also use it to uproot rice seedlings from the seedbed. Many Bolivian police and soldiers grow up on farms. The cop listened to my story with the interest of a farmer; then he thanked me for my explanation and said I was free to go. I think of that experience often, especially when I talk to farmers about videos they have seen. Rural people often recall the tools seen on a learning video, even devices not mentioned in the narration. Farmers notice tools that city people easily overlook. For example, in Malawi I talked to farmers about rice videos made in West Africa. The Malawians often remarked on the little wheeled, hand-pushed weeders, and wondered where they could get one. 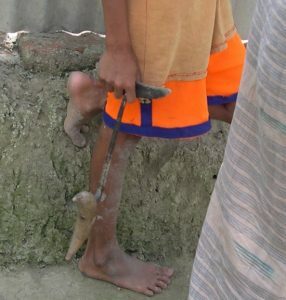 In Uganda, farmers noticed that the Malian rice farmers worked barefoot, and asked if the Malians could not afford gum boots, or if the bare feet were part of the technique. In fact, it is easier to work barefoot in a lowland, West African rice field, where the mud can pull the boots right off of one’s feet. And in one final example, in my blog last week, “Private screenings,” I mentioned that farmers in Benin searched for drip irrigation equipment after seeing it on a video. National officials and even some media experts insist that agricultural learning videos must be made locally, so a new video should be filmed for each country. Of course farmers can learn from a video made in their own country. But by watching videos made elsewhere they learn about tools and ideas they would not see at home. They learn how peasant farmers in other countries solve familiar problems with ingeniously different tools. That fires the imagination, and at times even inspires farmers to ask agrodealers to stock the new tools.